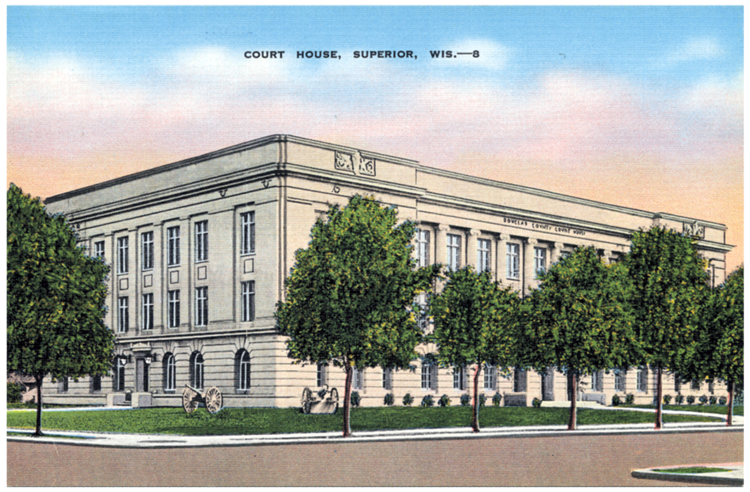 Principal architect Joseph Royer of Urbana, Illinois, beat out thirty other entries in a contest to design the Douglas County Courthouse; he took home a grand prize of $400. Today the Superior building stands as the city’s prime example of Classical Revival architecture. Made of Bedford blue cut stone, the building’s inner and outer vestibules are lined with marble wainscotting imported from Italy. Its entrance doors are made of copper, and it includes a leaded glass skylight. For its day, the building featured an unusual number of modern conveniences, including both men’s and women’s lavatories on each floor, office clocks controlled by a bronze master clock, and frost-proof locks on its exterior doors. Six-hundred-pound chandeliers still hang from the building’s courtrooms, and the facility even included a “janitor’s residence” when first constructed.